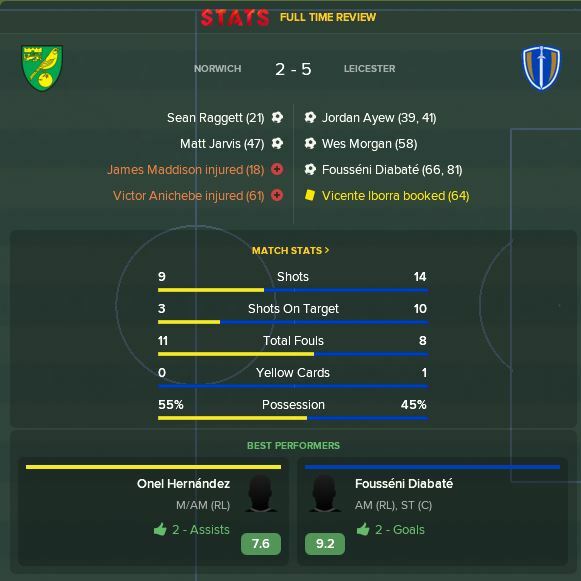 Welcome back to my FM18 experiment, where I try to recreate the simple tactical life of the classic Championship manager series by picking a tactic and sticking with it regardless. I’ve settled on an aggressive 5-2-3 number with Leicester, where the aim of the game is simply to get the ball over the top at all costs. It’s…silly. Anyway, it hasn’t all gone to pot yet which instantly makes it better than my usual attempts at this game. We re-join life at the King Power approaching the end of the transfer window. I have no money left. Nobody wants any of my bit part players and I’m not willing to upset anybody and try and force them out at this late stage as I’m just not confident I’d replace them. 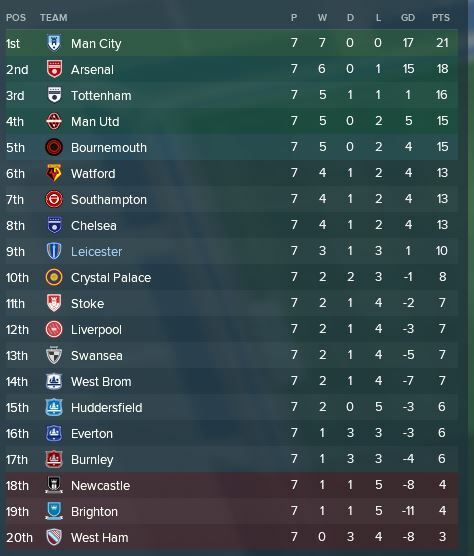 Also, we’re 6th. 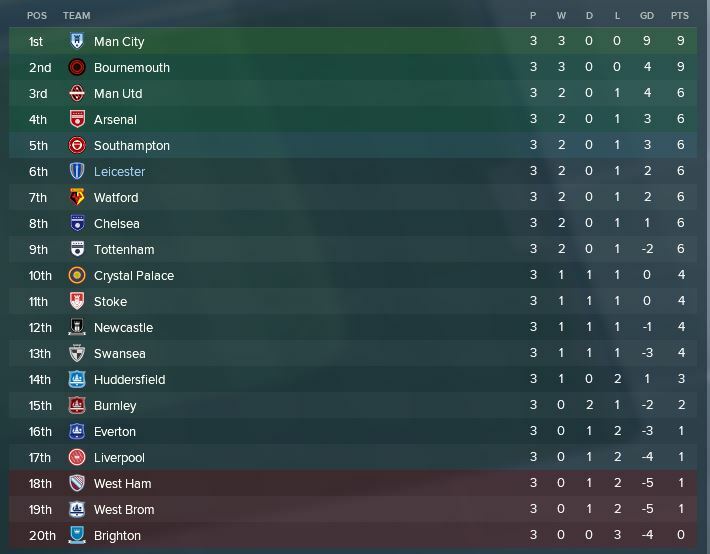 Ignore the games played column, we’re having the time our lives. An International break follows and thankfully nobody comes back on one leg. Everybody is dandy. It’s Man City next, I can only hope that most if not all of their squad have taken a trip somewhere very far away and they are all exceptionally tired. In September. Incredibly, we take the lead. Jordan Ayew looks one of my more astute signings and he puts us in front midway through the first half. Naturally, we are hanging on a bit at times but we make it to half-time and I tell the lads how much I love them and that binning the tactics board was a genius idea after all. Jordan Ayew laps it up and adds a second just after the break. I wonder what pose they’ll put my statue in? Probably one where my hands are firmly ensconced on my head. We give away a pen, which Aguero converts, and David Silva equalises from the edge of the box 6 minutes later. Nastastic puts through his own goal against his former club and then Man City are awarded a second penalty. It’s a 4-2 loss. What…just happened? We won’t be the first or last team to lose to Man City this season but our wait for a home win goes on. We’re off to the considerably less richer surrounds of Burnley next, where I am greeted by Sean Dyche drinking a cup of gravel. We’ve been better away from home but our entire game plan involves teams having the ball and us drawing them on to us. Burnley don’t seem that keen on keeping the ball so we’ll see. What follows is one of the most ridiculous games you will ever see. Ayew sticks us in front but Jack Cork pegs us back straight away, which proves Iheanacho to get off his backside for the first time in a while and put us in front. Ashley Barnes equalises immediately. I’m preparing to go nuts in the dressing room when Iheanacho scores again. 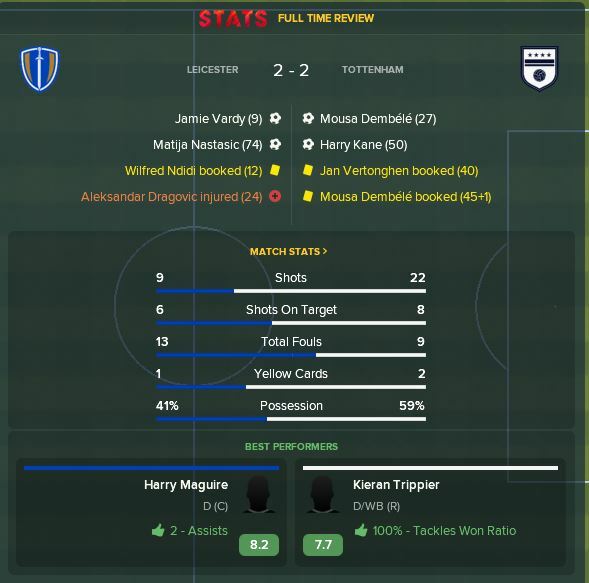 It’s a 3-2 lead at the break and Harry Maguire has 2 assists. From open play. 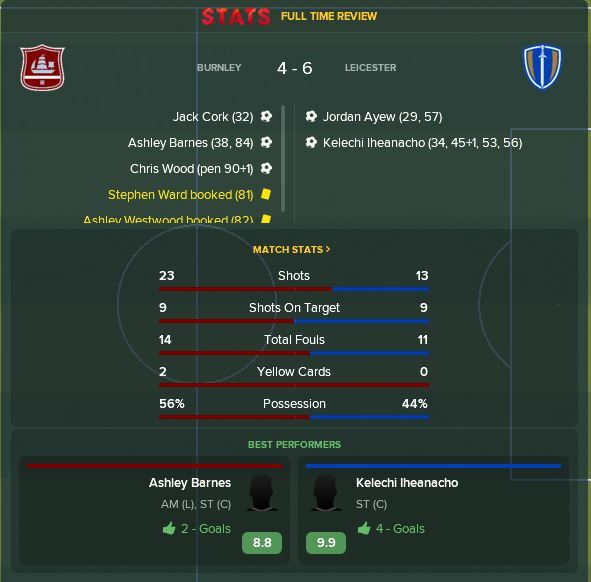 If you think that’s bad, Iheanacho and Ayew add 3 goals in 4 minutes at the start of a rampant second half to put us 6-2 ahead. Management, eh? Burnley pull two back late on including yet another penalty, but I don’t care. 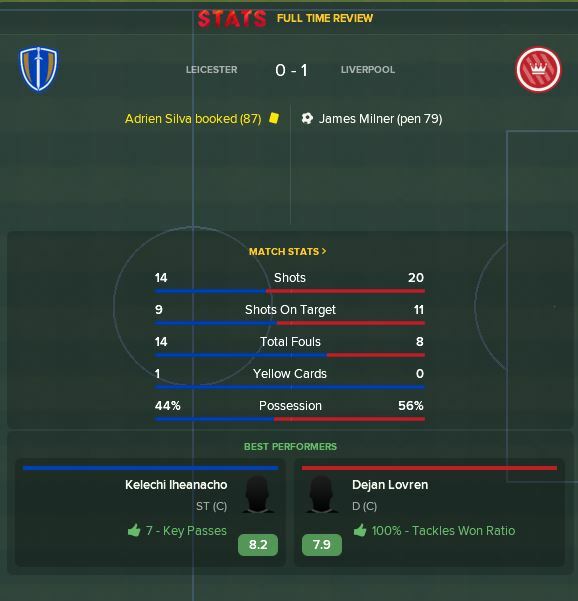 Iheanacho played a 9.9 for his 4 goals and 2 assists. Lovely stuff. It’s Norwich in the League Cup and an opportunity to rest a few. Diabate is training to be a complete forward so the game time will do him good, and Wes Morgan is in for Nastasic whose leg could explode at any time. Not today. Naturally, we concede first before Ayew scores another brace. To think, Wes booted off at me sacrificing Christian Fuchs for him. It’s soon 2-2 but that just angers us and even Wes Morgan scores, before Diabate shows he could be an option by adding two goals to an impressive performance. His 9.2 rating scores him as better than Okazaki in my eyes and I await Watford bidding for my Japanese International with that famous poker face – GIVE ME YOUR MONEY. Back to league action though and we need to find a way to win at home. Tottenham are not the opponents I want to see and although we lead through Vardy, the surprisingly useful Dragovic goes off injured and it’s Wes vs pace and that can’t end well. We’re soon 2-1 down before Nastasic heads in an equaliser. Progress? Who knows. They managed 22 shots at our goal, which is really not a strong point for us. Two more assists for Maguire though, the end of season tally up is going to look ridiculous. Another home game up next and it’s only Liverpool. Who makes these fixture lists? They’re not having the best of times and it’s probably an opportunity, but in a fairly even game we concede yet another penalty and we lose 1-0. Are we clumsy or unlucky? Probably clumsy. Still no win at home then but we’re dynamite away from where the majority of our fans get to watch us play and isn’t that the main thing? Time for another International break as I ponder how I could change the personnel in this formation to help us at home. I’ve got nothing. See you next week.